For 27 year-old Johnathan Gunn, it's been a difficult road. Born and diagnosed with seven disabilities, including Cerebral palsy, Lowe's Syndrome, developmentally delayed, legally blind, severe orthopedic impairments and aplastic anemia/cancer, life was already an uphill battle. At age ten, a playground injury at school only made things worse. A hit in the face by a swing resulted in a split lip, which was sewn together at a local hospital. But it wasn't until several months later, when he and his mother had returned to their home in Nettletown, Mississippi, that the full extent of Johnathan's injuries were discovered. At the University of Mississippi Medical Center, doctors discovered that the bones in Johnathan's face were fractured, the nerves damaged and an infection building to the point of permanent brain damage and loss of eyesight. For the next 11 years, Johnathan underwent surgery on his face, mouth and jaw area, for a total of nearly 30 surgeries. 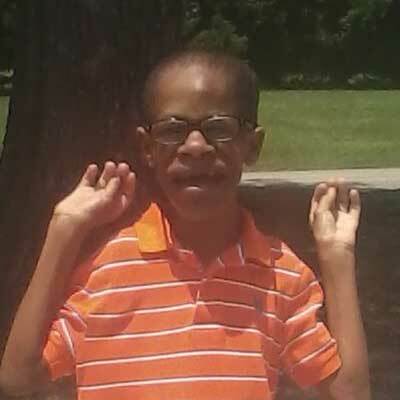 Unable to communicate, Johnathan and his mother reached out to the University of Mississippi for a speech-language evaluation. At 26 years of age, Johnathan could produce some words but was not very well understood, which was intensely frustrating for this young man. His SLP, Kathy Wentland, began by noting Johnathan's vision issues, which in turn led to her trialing an Accent device with LAMP Words for Life. "Because of his vision issues, I felt that the consistent motor plan of LAMP Words for Life would be most beneficial for him," she said. As Johnathan began working with Kathy, he became more comfortable with the device, increasing his language and communication skills. "He quickly became comfortable communicating with me in therapy, so we then transitioned to working on him communicating with others," she said. Wentland also credits the training she received in the LAMP methodology, specifically fading cues/prompts, for Johnathan becoming more spontaneous and initiating communication through the device. After using a loaner device from Project Start at UMMC for six months, Johnathan received his Accent with LAMP Words for Life in April 2018. Johnathan's Accent device + LAMP Words for Life have meant the world to Johnathan and his mother, Shelia. "It's been a blessing to Johnathan because with such nerve ending facial trauma, he does not have feelings in his face and may never be able to talk or speak words," she said. Johnathan is now able to express his needs and wants instead of becoming confused and frustrated when he wasn't understood, for which his mother is grateful. "Thank God that PRC has opened up a new way of life for Johnathan," she said. "It's a blessing that I have prayed for for years, and never stopped praying, continuously with all faith and hope and endurance for Johnathan."